This short railway, just under three miles in length, linked the fishing port of Eyemouth in the old Scottish Borders county of Berwickshire with the East Coast Main Line at Burnmouth. 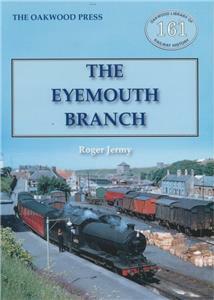 Eyemouth was the only station on the branch. The line crossed an impressive viaduct over the River Eye which was damaged by flooding in 1948, the event regarded as the cause of the ultimate closure of the branch line. Opened in the 1890s by the independent Eyemouth Railway Company and closed in 1962 by British Railways the line largely conveyed fish to the markets of Birmingham and Edinburgh and in the opposite direction coal and fuel oil for the port. It also carried some excursion traffic to the seaside town and schoolchildren and commuters to and from Duns and Berwick. The 16 chapters include proposals, the building of the line, the route, operation at different periods, depots and locomotives, the fishing industry, freight traffic, accidents, the 1948 flood and ‘Hie-moo’ humour. The last chapter deals with the remains as they are today.